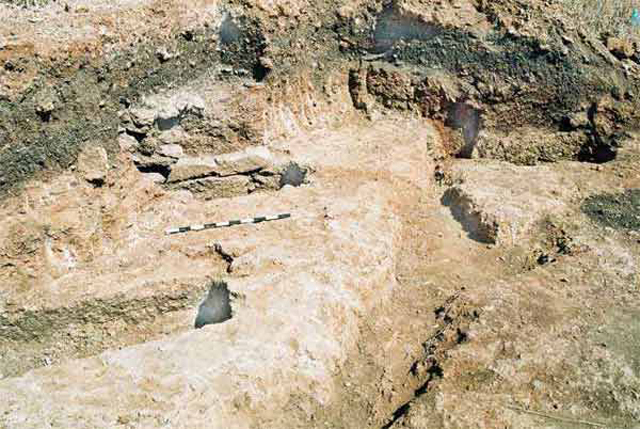 During June 2004, a salvage excavation was conducted in Qibbuz Senir (Permit No. A-4174*; map ref. 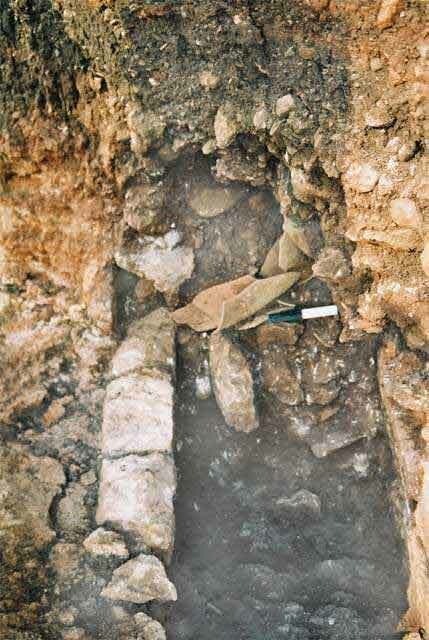 NIG 26377/79445; OIG 21377/29445), after three tombs were damaged when the area was prepared for construction. The excavation, on behalf of the Antiquities Authority, was directed by M. Hartal, with the assistance of Y. Ya‘aqoby (administration), A. Hajian (surveying and drafting), Y. Nagar (physical anthropology), E. Altmark (metallurgical laboratory), L. Porat (pottery restoration) and H. Tahan (pottery drawing). Qibbuz Senir is built on part of the western cemetery of the city of Panias. Burial caves from the Roman period had previously been documented in the vicinity and two were excavated (HA 48-49:24 [Hebrew]; Permit Nos. A-1440, A-1650). A burial compound from the Roman period (HA-ESI 116) was excavated c. 260 m northwest the current excavation. The excavation area (7.5 × 7.5 m) was located along the eastern fringes of the western cemetery of Panias. Three hewn cist tombs from the Roman period (Loci 101–103; Figs. 1–3), oriented northeast–southwest, were exposed. 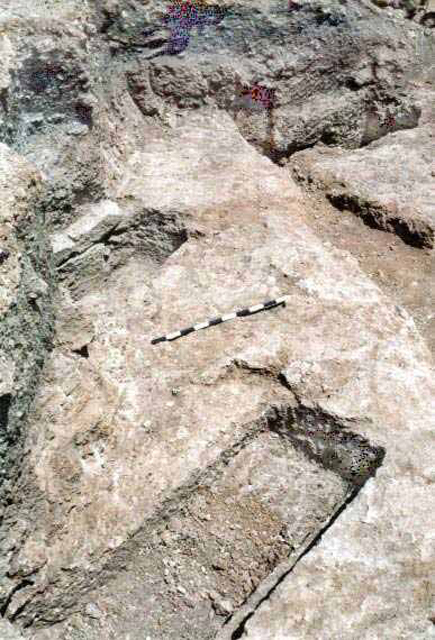 The western part of the excavation area, where Tombs 102 and 103 were hewn, was quarried to a depth of c. 0.8 m. A natural channel (L105; width 0.1–1.0 m), aligned southeast–northwest, ran through the middle of the area and had cut Tomb 101. The channel was apparently cut due to the eastward inclination of bedrock, probably after the tombs were quarried. Tomb 101 (0.85 × 2.08 m, depth 1.0–1.3 m). Along the entire upper part of the tomb’s northwestern wall was a hewn bedrock ledge (width 0.22 m), over which a course of stones had been placed; one pf the stones was preserved in situ. The western part of the tomb was cut by Channel 105. It seems that the tomb was plundered after its exposure and prior to the excavation, based on marks left by the teeth of a backhoe bucket, visible at the bottom of the tomb. Several bones of the deceased who was more than fifteen years of age were recovered from the tomb, as well as an iron ring that served as a coffin handle, several iron nails and small bronze nails. The deceased was apparently interred in a wooden coffin. Tomb 102 (0.58 × 2.00 m, depth 0.7 m; Fig. 4). Shelves (width 0.22 m) were hewn in the upper part of the northern and southern sides of the tomb and a single course of ashlar stones was placed on each of them. A single covering stone was preserved on the tomb, which had been looted in antiquity. The tomb contained a few human bones that belonged to an adult and an infant, two–three years of age, an intact glass bottle (Fig. 5) and a ceramic unguentarium, both dating to the first century CE, numerous fragments of pottery vessels from the first century CE, including bowls (Fig. 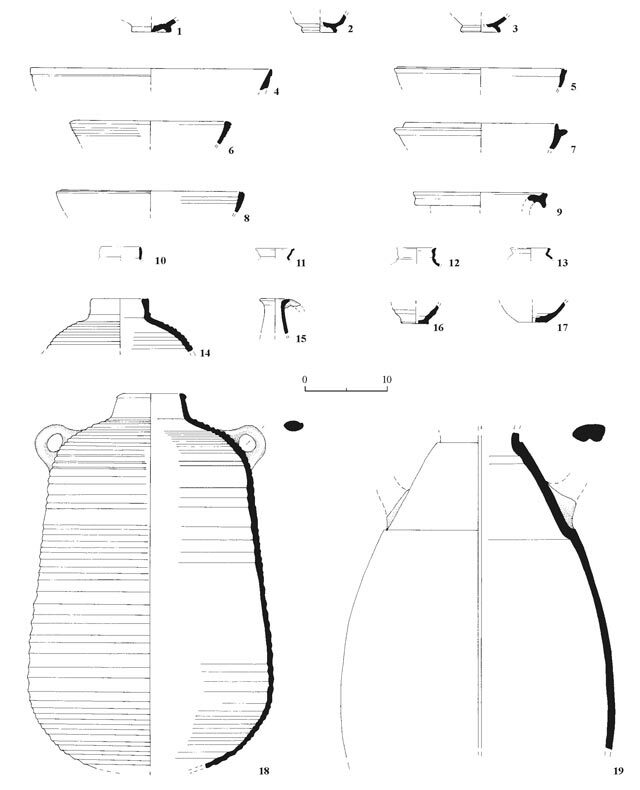 6:1–9), cooking pots (Fig. 6:10–13), jars (Fig. 6:14) and juglets (Fig. 6:15–17) that probably originated in the soil that had washed into the pit, as well as a few iron nails and small bronze nails. No iron coffin handles were discovered in the tomb like those in the other two and the deceased were probably interred without coffins. After the burial, the tomb was sealed with stone slabs, one of which remained in situ. Jars and an amphora, almost complete (Fig. 6:18, 19), were found on the covering slab. The bones of an infant that had died at birth were discovered inside one of the jars, which were surrounded by fieldstones and covered with stone slabs. It seems that an adult and an infant were buried in the tomb in the first phase, possibly a mother and her son. Later, two jars were placed on the covering stone of the tomb; inside one of them were the bones of an infant and it is postulated that the second jar also included infant bones, although none were found. Tomb 103 (0.85 × 1.95 m, depth 0.8 m). A narrow shelf (width 8–11 cm) was hewn in the bottom part of the southeastern side of the tomb, which was disturbed, probably due to looting in antiquity. The lower limb bones of the deceased were discovered in the southern part of the tomb, as well as several other bones that belonged to an adult, older than fifteen years of age. 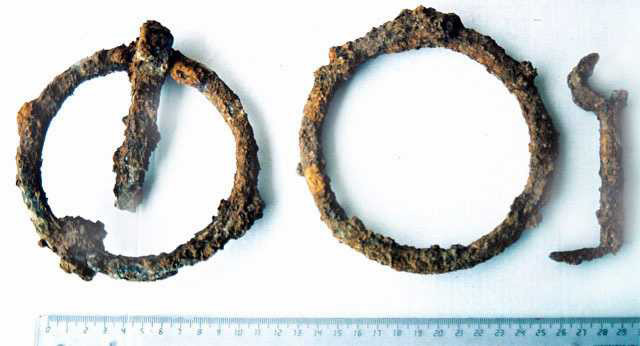 Other finds included two iron rings (diam. 0.12 m; Fig. 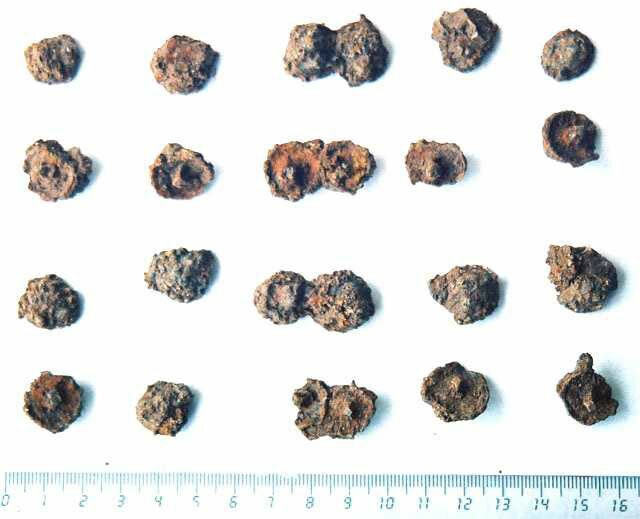 7) that were used as handles for a wooden coffin, iron nails and iron tacks, both having round heads (Fig. 8). The nails were probably used in the construction of the coffin from wooden planks, 4 cm thick; the iron tacks have probably survived from sandals. A few potsherds that probably originated in the soil that had washed into the tomb and dated to the first century CE, were found. The excavated tombs were part of the cemetery of Panias from the Roman period (Caesarea Phillippi). They dated to the first century CE, right after the founding of the city in the years 2–1 BCE by Phillip, the son of Herod. It was built as a pagan city, with temples dedicated to Pan, Augustus, Zeus and other gods. The city was the capital of Phillip’s tetrarchy in northern Transjordan and people from the Bashan and Huran had moved there, living alongside the Iturean residents and a Jewish community. Surveys performed in Banias ascertained that the city was surrounded by cemeteries. Jar burials were rare in the Roman period and apparently not practiced by Jews. It therefore appears that the deceased were members of the city’s pagan population. The artifacts recovered from the excavation are important for dating the local pottery industry of Banias that flourished in the second–fifth centuries CE. The lack of ‘Banias bowls’ from the ceramic finds corroborates the assumption that mass production of pottery in Banias did not begin prior to the second century CE, when the city was annexed to the Syrian province. 3. The excavation area, looking north. 4. Tomb 102, looking west; in the section, fragments of the jar with infant burial.